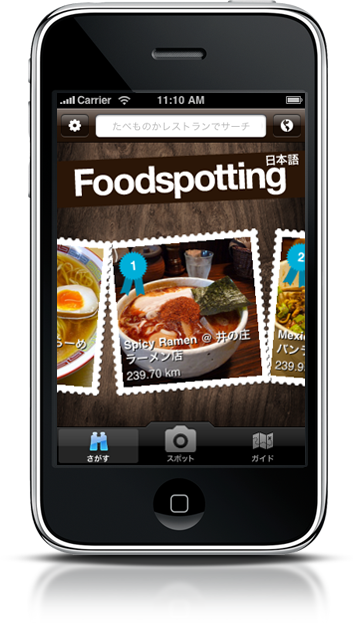 Foodspotting check-in app has rapid growth in Japan. This past week the founder and CEO of Foodspotting, Alexa Andrzejewski, traveled around Japan to meet some of the users of Foodspotting in Japan. The Foodspotting site and iPhone App launched earlier this year, with both you can view or search for photos of food from nearby restaurants. You might think of it as a visual menu of food from local restaurants, with photos added based on what the user likes. An Eatup was organized in order for Alexa to meet foodspotters from around Tokyo. The Foodspotting Eatup was held at a newly opened restaurant on a back street in Shibuya. I had the opportunity to attend the Eatup and meet Alexa as well as some of the top Foodspotting users in Japan. The top two Foodspotters are touchan with 279 spots (or check-ins) and eataru with 392 spots. If 279 and 392 photo posts doesn’t sound like a lot to you, consider the fact that Foodspotting was only just launched in January. Touchan said he prefers to use Foodspotting to share food from local restaurants where the food is self prepared and service is friendly rather than expensive places. Many of his co-workers ask him for advice on good places to eat, and they now check his Foodspotting profile for his updates. When I spoke with Alexa I mentioned that Foursquare has a large user base in Japan, and asked where is Foodspotting used the most outside of the US? She didn’t have exact figures on hand, and while NY and San Fransisco are some of the top locations in the US; for locations outside the US Tokyo has the largest amount of users. Why is Tokyo the biggest Foodspotting city outside of the US? In order to support the growing number of users in Japan, this week Foodspotting released a Japanese version of the Foodspotting app for iPhone. This is the first time their app has been released in a language other than english. To try out Foodspotting sign up on their website or if you have an iPhone search for the free Foodspotting app in the App store.